I am working on the Cromwell Court Afghan that I got through the Lion Brand web site. 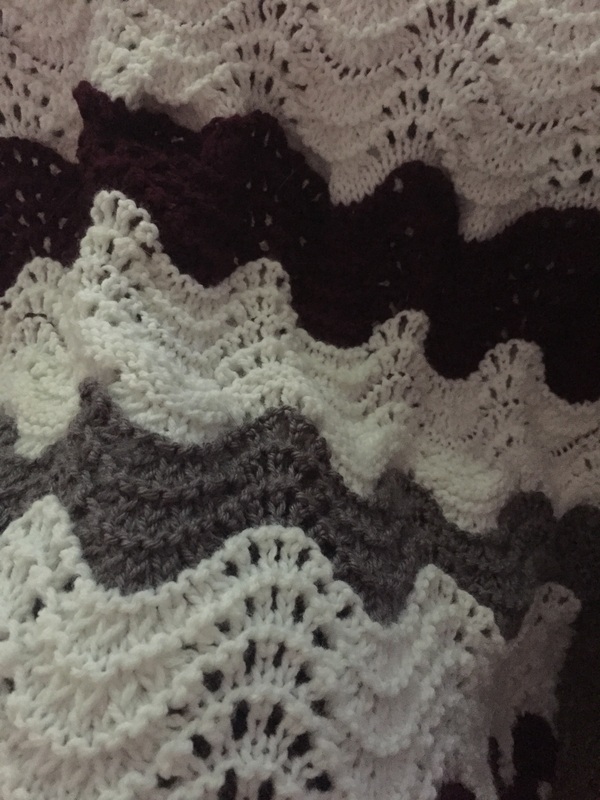 See the link below if you are interested in making this afghan yourself. I am making it for my step-mom because she requested that I make her an afghan. I think the pattern is very pretty even if it is repetitious. Did I ever mention that I don’t like repetition? I don’t know how I enjoy knitting because it really is a series of repeats and repetition to get your project done! 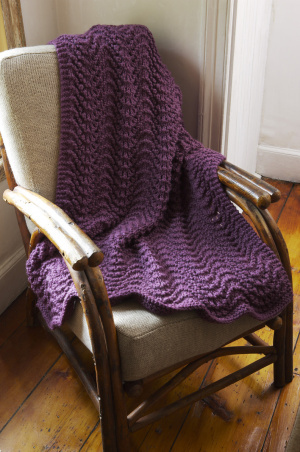 I do love it though because of the pretty things that I can make with yarn! 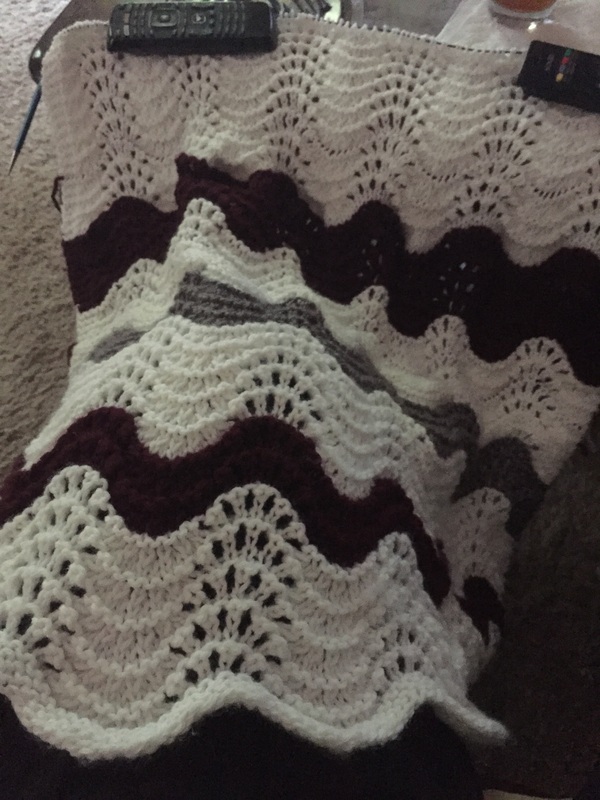 I am doing this blanket in 3 colors. 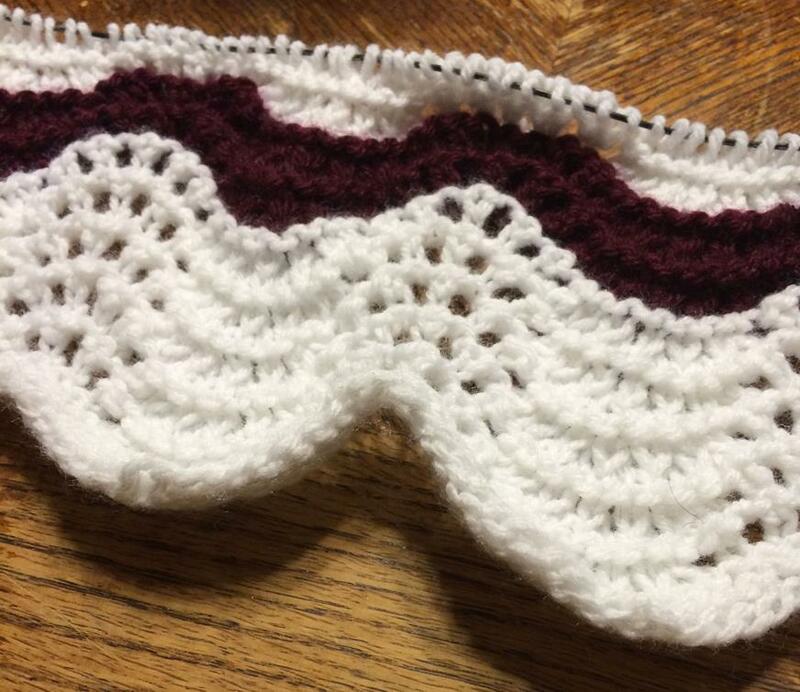 I am using white as the main colorway and accenting it with burgundy and gray. I have more of it done than this picture, but I wanted to get this out on my blog today and I have yet to take a picture of it in it’s current state and upload it. ( I have uploaded new pictures as of 07/16/2015.) 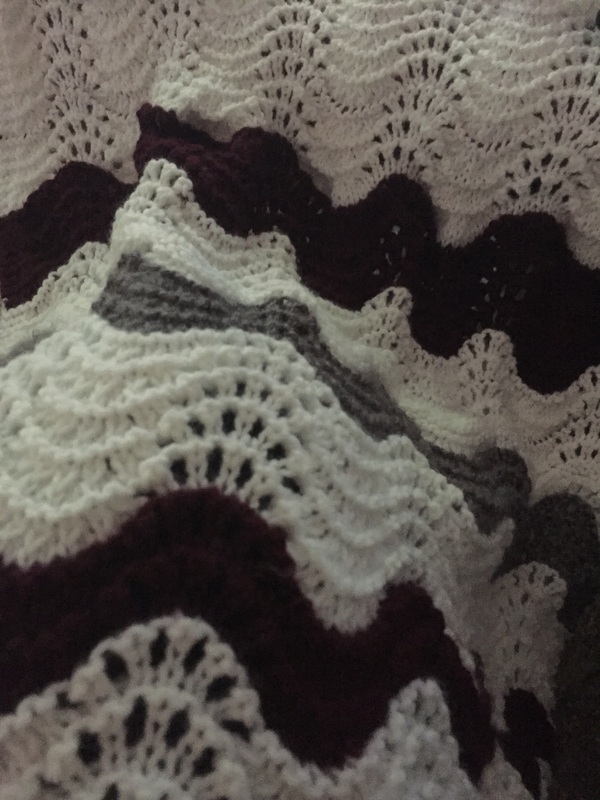 I see the merits of doing it all in 1 color, but I really like the colors that I have chosen for this blanket and I know Rachael will love it. I have made a few changes to how I am doing the pattern. I am using more than 1 color, and I am using US size 10 needles. The pattern called for US size 13 needles but I can’t get into a rhythm with those needles. They are just too big and cumbersome to knit with. I don’t know how people knit with those size 35 and 50 needles! As it stands now, even the size 10 needles are too long for me to knit with comfortably. I have a problem with longer needles, which is why I don’t use straight needles. Do you find that you use circular needles almost exclusively or do you use straight needles almost exclusively? Interchangeable versus fixed circular’s? What is your favorite length for your needles? I think my favorite length for my fixed circulars is the 5 inches for the needle itself and 47 inches for the cable so that I can do magic loop easily. My favorite length for my DPN’s is 5 inches as well. The longer DPN’s get in my way and it makes for a very frustrating knitting session when I use the longer DPN’s. Sometimes it is necessary to use a long DPN because of the amount of stitches that wind up on the heel needle. In that case, I have 5 inches for the instep stitches and a 7 inch for the heel needle. For this afghan, the size 10 needles are about 6 inches long with a 32-inch cable on them, and I find it very difficult as my project grows to get into a rhythm with the pattern so that I can hit my knitting zen level that I usually reach when I am working on a pattern that I have memorized. This pattern is one that I have memorized so I don’t have to look at the pattern every 10 seconds to see what I am supposed to do. Most of the work happens on row 3. The other 3 rows are simple knits and purls. Row 3 is where you are doing the YO and the K2tog stitches to make the wave in it. I did something stupid though. I got bored with the pattern and I decided to do stockinette thinking that it would be extra warm where the stockinette was. My plan was to knit a large amount of straight stockinette and then when I wanted to end it I would start back with this pattern at the end to make the ends match. I got several rows done and I just didn’t care for the way it looked, so I ripped it back to the lifeline and I am now about where I was before I did that stupid thing. I really have to stop changing things up like that, and if I insist on doing it, then I need to run a lifeline BEFORE I start doing the different pattern so that I don’t have to rip back many rows to get to my original lifeline that I ran way back. It almost feels like I am starting over. Once I got everything back on my needles, I counted my stitches to see if I had 114 stitches like the pattern calls for, and I had 124 instead of 114 stitches! I can’t remember why I have more stitches than called for. I started this pattern last year sometime, and I didn’t take notes on it so I have no clue why I have more stitches. Nevertheless, I did several P2tog stitches on my last purl row to bring the count down to 114. I hope it doesn’t make it look weird. I tried to space out the P2tog stitches all across the row, so I am hopeful that the difference between the 124 stitches and the 114 stitches won’t be too noticeable. It is a design element, yeah! That is it! It is a design element for this afghan. That’s my story and I’m sticking to it!! 1. Always, always run a lifeline before you start to change a pattern in case you decide you don’t like it you don’t have far to rip back! Ya’ll have a great day and the rest of your weekend!